Holistic healing practitioners use the term to describe the use of sound waves transmitted through the human body in order to normalize imbalances and synchronize the cells' frequencies back to their natural, healthy state of vibrational resonance. 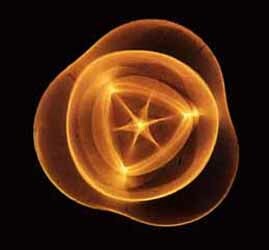 The term cymatics was coined by the Swiss scientist Hans Jenny (1904 - 1972), it is derived from the greek "kyma" meaning "wave", and "ta kymatica" meaning "matters pertaining to waves". 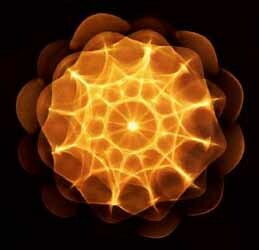 Cymatics was explored by Hans Jenny who published a book by that title in 1967. Inspired by systems theory, the work of Ernst Chladni, and his medical practice, Jenny began an investigation of periodic phenomena but especially the visual display of sound. 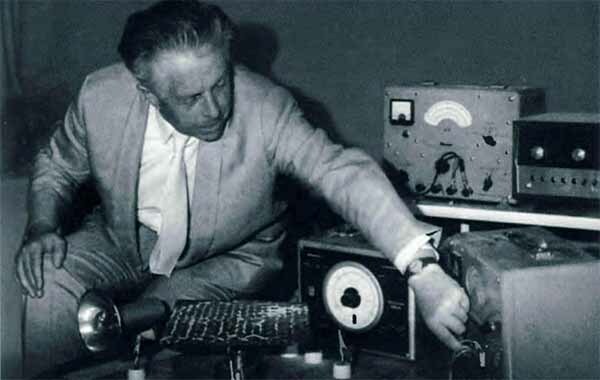 He used standing waves, piezoelectric amplifiers, and other methods and materials. A simple experiment demonstrating the visualization of cymatics can be done by sprinkling sand on a metal plate and vibrating the plate, for example by drawing a violin bow along the edge, the sand will then form itself into standing wave patterns such as simple concentric circles. One of Jenny's more complex experiments include a spherical vibrating water droplet containing fine particles, these particles then formed into a 3-Dimensional star (or dual) tetrahedron shape with surrounding circles as shown below. Jenny's book influenced Alvin Lucier and, along with Chladni, helped lead to his composition Queen of the South. Jenny's work was also followed up by Center for Advanced Visual Study (CAVS) founder Gyorgy Kepes at MIT. His work in this area included an acoustically vibrated piece of sheet metal in which small holes had been drilled in a grid. Small flames of gas burned through these holes and thermodynamic patterns were made visible by this setup. The Rosslyn Stave Angel - Music Cipher YouTube (4 min 40 sec.). This is after Stuart and I talked about 440.